Learn about the many reasons why financial planning is a necessity. Would you take a road trip without a map or GPS? In this episode, Bob and Mary Jo cover the many reasons for needing financial planning. Financial planning is the process of wisely managing your finances so that you can achieve your dreams and goals – quite simply, a map to help get you to the financial future you desire. A realistic, comprehensive plan can help you meet your goals by addressing your financial weaknesses and building on your financial strengths. Without a plan and a strategy, there can be a lot of unnecessary risk in achieving these goals; risk that can cause emotional stress and financial distress if not managed properly. You don’t have to do it alone. A qualified financial planner, such as Certified Financial Planner (CFP®) professional, can help you make decisions that make the most of your financial resources. 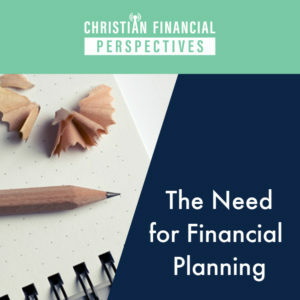 Christian Financial Perspectives aims to teach our listeners how to apply Biblical principles to make wise financial decisions. We hope that you enjoy listening to Christian Financial Perspectives Podcast as much as we enjoy making it!